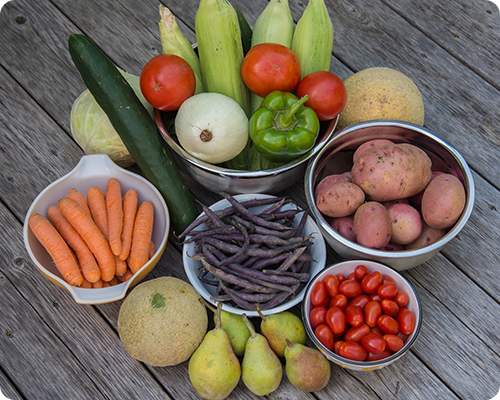 So much goodness in this week's box: cabbage, cantaloupe, corn, field tomatoes, grape tomatoes, cucumber, pears, carrots, purple beans, potatoes, green pepper, and onion. With this week's box being very similar to last week's, I didn't try any new recipes, but simply remade some of our favorite dishes. 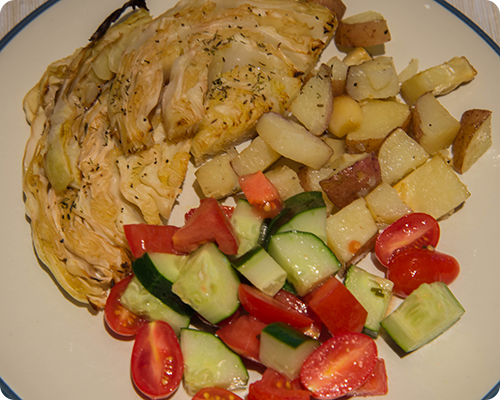 One night we even had an entire dinner prepared from what came in our box: Balsamic Honey Roasted Cabbage Steak (try this, it is delicious, and an excellent way to get cabbage into your diet), roasted potatoes (nothing fancy, just olive oil, salt, and pepper), and Tomato and Cucumber Salad (I was going to add basil from the garden, but it was pouring rain so I could not go outside). This was a lighter dinner, but with it being so hot outside, it was perfect. Tomorrow we pick up our next box....I'm excited to see what is inside.